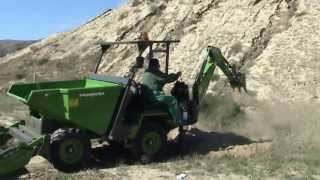 HYDROSTATIC DUMPER. FRONTAL UNLOADING AND SELFLOADING. MAX. WORKING LOAD: 2.500 Kg. ENGINE: 50 H.P. TRANSMISSION: HYDROSTATICS 4x4. Two speeds Hydrostatic transmission. Four wheels drive. Perkins 404-C diesel engine, four cylinders, water cooled, 50 H.P. Hydraulic frontal unload. Hydraulic brakes. Electrical start and stop. Max. working load: 2.500 kg. Drag bolt. Hook plate for installation of accessories (Backhoe, Forklift attachment, etc.). Conductor’s protective ceiling. Flashing beacon. Hour meter. Audible reverse warning signal. Safety belt.